Police in Northern Ireland believe the same criminal gang may be responsible for a spate of ATM thefts this year. An investigation is under way after the latest robbery in Irvinestown, Co Fermanagh, early this morning. 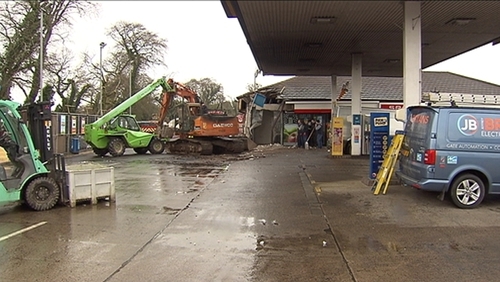 Police said thieves used a digger to remove the 'built-in' cash machine from a filling station on the Dromore Road just after 4am. Police say it probably took less than two minutes for the cash machine to be ripped from the wall. It is believed to have contained tens of thousands of pounds. It is believed they then used a trailer to carry the machine away. The PSNI said the digger was stolen from a nearby site under development. The digger was set on fire following the theft. There have now been six ATM thefts in Northern Ireland since the start of the year - in counties Antrim, Armagh, Tyrone and Fermanagh. Thieves also struck in Co Cavan two weeks ago. The PSNI said it is possible the same gang may be responsible and have set up a special team of detectives to try to catch them. The garage in Dromore Road reopened this afternoon. Customers say they are fearful the owner will not re-install a facility widely used by the local community. The PSNI have appealed for anyone who may have been in the Irvinestown between 3.30am and 4.10am overnight and who may have seen suspicious activity to contact them.